Just ask my husband. 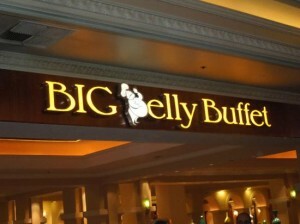 He will tell you that I would eat some sort of “Mexican” or “Tex-Mex” food every day if I could. The flavors of cilantro, lime, green chiles, cumin, and smoky adobo chiles beckon to me. My Chicken and Spinach Enchiladas with Green Chile Sauce are one of my favorite meals. Mine are by no means “authentic” recipes, just flavors that work well together. I love crispy tostadas or soft tacos with my Smoky Chipotle Chicken filling, avocado slices, Monterey Jack cheese, and freshly made pico de gallo with garden tomatoes, jalapenos, scallions, lime juice and cilantro. My Chicken Taco Salad is also a staple, especially in the summer when veggies are at their prime. 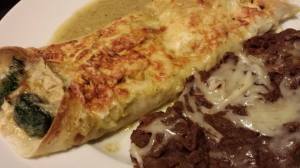 In the interest of healthier eating, I try to “lighten up” my Mexican food dishes. Using the smaller fajita-size tortillas, cutting back on the amount of cheese, using fat-free cheese, not dousing everything with sour cream, etc., and just generally eating less, will help adjust the calorie and fat content of the dish. I’ve cut back a bit on the frequency of my Mexican food habit so when I do make my own Mexican or Tex-Mex meals, it’s worth the wait. 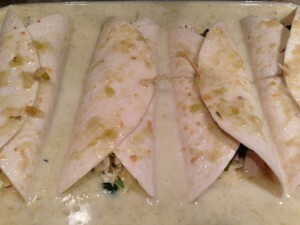 My Chicken and Spinach Enchiladas with Green Chile Sauce recipe is pretty simple. 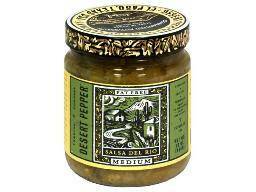 I use pre-made store-bought green salsa, although I sometimes make my own green chile salsa with fire-roasted diced green chiles and my favorite seasonings. 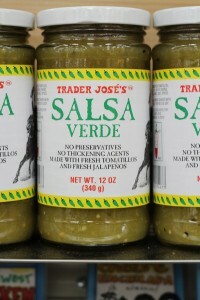 On weeknights when I have less time, I prefer to use Trader Joe’s Salsa Verde or Desert Pepper Green Salsa in this recipe. Just combine the green salsa with chicken broth/stock and a small amount of heavy cream to make a delicious sauce. Use leftover pre-cooked chicken, or you can poach a chicken breast for this recipe. I usually use leftover roasted chicken from another meal. 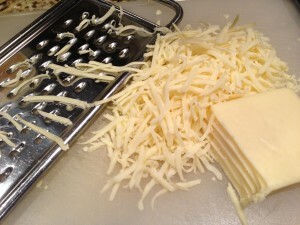 Shred the Monterey Jack cheese. Dice and saute some onion. 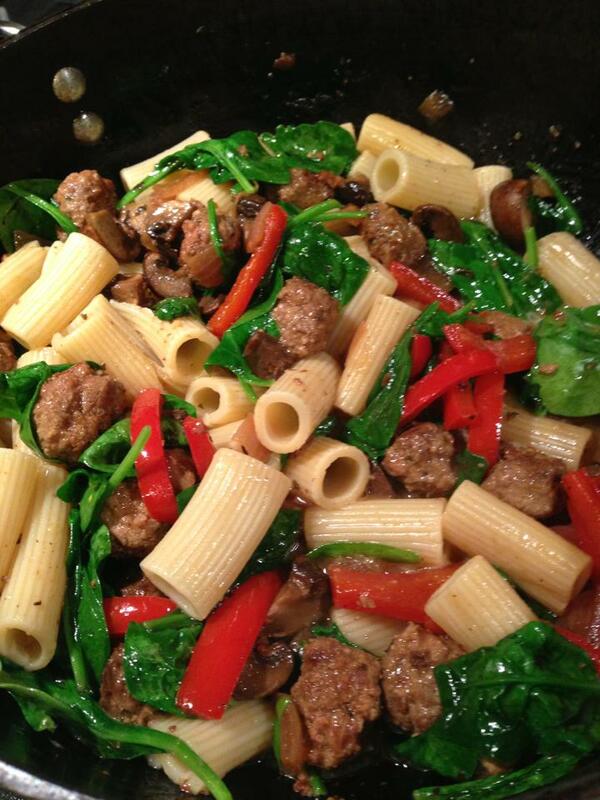 Mix in the fresh spinach until it wilts. 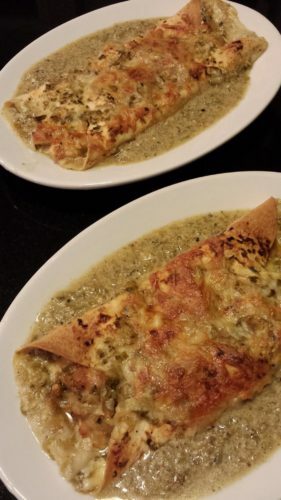 Stuff some fajita-size flour tortillas with the chicken/spinach/cheese filling, roll them up, smother them with the green chile sauce, sprinkle on some cheese, and bake! 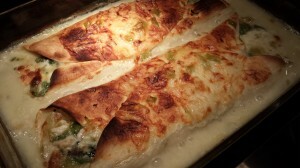 Make a large batch of these chicken and spinach enchiladas for a party buffet. You can use smaller corn tortillas and your filling will likely go further. Your guests will love them. Serve with a favorite Mexican beer or fruity Sangria wine. 1. Spray a baking pan with cooking spray. 3. In a non-metallic bowl, combine green salsa with chicken broth/stock and heavy cream. Set aside. 4. Heat olive oil in a non-stick skillet over medium heat. 5. 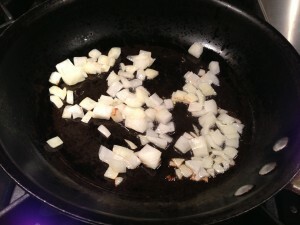 Saute diced onion until translucent. 6. Add fresh spinach to diced onion and stir until spinach is wilted. Remove from heat. 7. Dice cooked chicken, shred Monterey Jack cheese, and chop cilantro. 8. 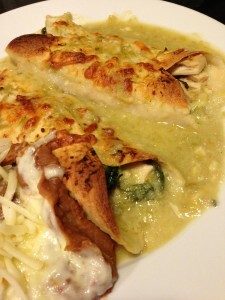 Combine chicken, 1 cup of the Monterey Jack cheese, and cilantro. Set aside. 9. Pour about 1/2 cup of green chile mixture on bottom of baking pan. 10. On cutting board, set out all four tortillas. 11. Divide chicken/cheese/cilantro mixture amongst tortillas. 12. 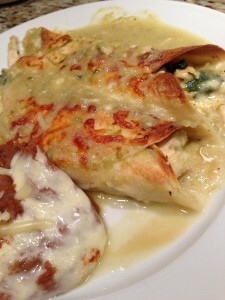 Divide onion/spinach mixture amongst tortillas, topping chicken mixture. 13. Roll up tortillas and secure each with a toothpick so they don’t pop open in the oven. 14. Place filled tortillas in sauce in the baking pan. Cover with the rest of the sauce. 15. Sprinkle the 1/4 reserved shredded Monterey Jack cheese over the top of the tortillas. 16. 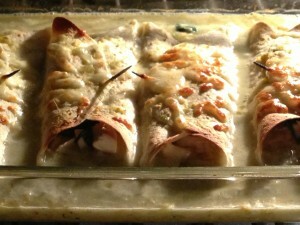 Bake at 350 degrees, uncovered, for 20 minutes or until enchiladas are slightly browned on top and centers are bubbling. 17. Remove pan from oven. Remove toothpicks from enchiladas. 18. 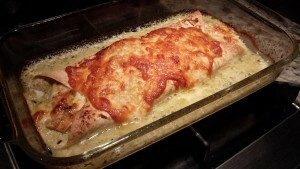 Place two enchiladas on each plate, and drizzle any remaining sauce around the enchiladas. 19. 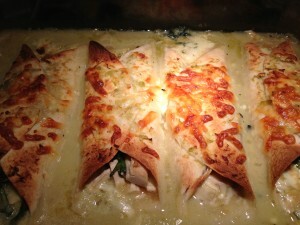 Serve with a dollop of sour cream or Mexican Crema , or additional chopped cilantro, if desired. Serves 2 as a main course with a side of refried beans. Serves 4 with other main course accompaniments such as tacos, tostadas, burritos, a side salad, etc. Serve with a dollop of Mexican Crema , sour cream or thick Greek yogurt. 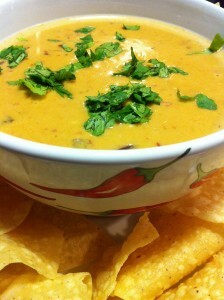 Start with my creamy cheesy Chipotle Chile Con Queso dip with tortilla chips, or Richard’s Salsa for a healthier alternative appetizer. 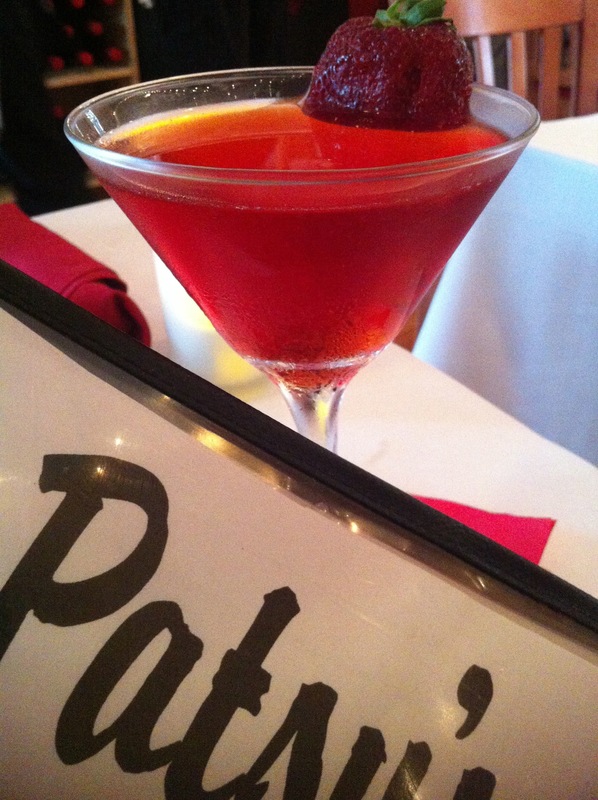 Serve with sangria or beer or soft drinks. Variations: Omit the chicken and chicken broth/stock for a vegetarian dish. Omit the cilantro if you are not a fan. Substitute corn tortillas for the flour tortillas for a different flavor. 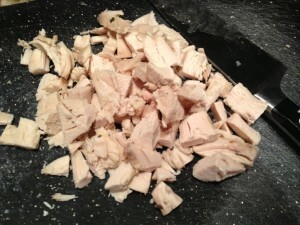 Swap out the chicken for diced cooked turkey or diced cooked shrimp. Add chopped garlic to the onion/spinach mixture. Substitute chopped kale for the spinach. Instead of rolling up the enchiladas, stack them, and add a fifth tortilla on top, then smother with the sauce (it might take a bit longer to bake the enchilada stack, so check the middle often for doneness). To lighten this recipe, use fat free Monterey Jack cheese (or another cheese) and limit the amount of cheese used, use more spinach, add other vegetables such as sauteed squash or mushrooms. Omit the cream from the sauce. Top with healthier pico de gallo instead of sour cream or Mexican Crema .